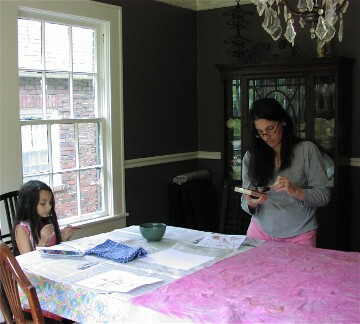 I set some time aside this weekend to dye and paint fabric for my daughter’s birthday dress. I knew I had to do this from the minute I saw Theresa’s new dress pattern. 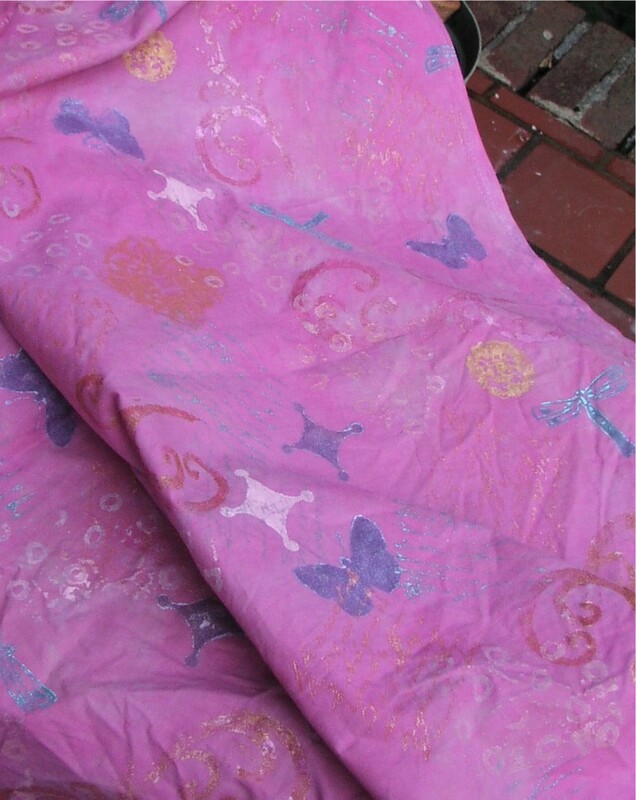 The fabric was dyed a soft, crystal washed gray and overdyed in pink and then, while she painted beautiful pictures, I stamped layers of images and text onto the fabric. The result was bright and fun, but not what either of us had envisioned for the dress. I suspect this fabric will find another use, perhaps as a wall hanging in our playroom where it looks just smashing. I think I will substitute some hemp silk fabric I recently dyed a lovely, soft ecru-pink for her dress. Finally to complete my troika of bad pictures, I dyed some soft merino yarn last night that looks absolutely fantastic in person, but didn’t want to photograph in the twilight. 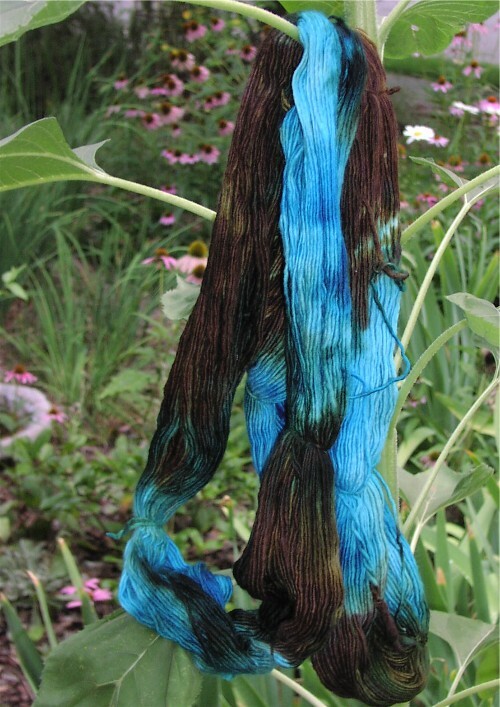 The blue is more turquoisey and brilliant, and the brown is softer and runs through more of a patina range (my current obsession), but the picture at least gives you an idea. This yarn is hallmarked as a winter pair of pants for my son — although he’s just about out of cloth diapers, he still loves wearing his knit longie diaper covers, so I think I’ll make him at least one pair of knit pants to lounge around in this fall and winter. Oh I love the colorway. Brown/blues are my current fave. Gorgeous. Joyce I love that fabric SO gorgeous! I can’t wait to see you knit the lounge pants with that pretty yarn too 😀 Which super soft Merino are you using if you don’t mind me asking? Do you know what pattern you’re going to go with yet? Oh what fun you have been having!! can I come and stay and play for a while!!! love the little dress pattern and the fabric sure looks great!!! but just too bright for her??? I love it!! and the yarn is yummy!!!! sure wish I was there to play!!! but is fun to see all the results and all!!! thanks for sharing!!! Keiran who has long been out of diapers wears some long knitted pants that his grandmother made him. They are dark brown and look so cute on him. Hopefully they will fit him this winter. I love the blue and brown together.